"In America: The Story of the Soul Sisters", that won the "Best Film by an African Abroad" at the 2011 African Movie Academy Award, will be shown in Abuja on Thursday August 7th, 2014 at the National Press Centre, Radio House. The film, which will be brought to viewers by the Nigeria's Ministry of Information and Oracle Films, has been shown at many schools in the United States, including Harvard University, Massachusetts Institute of Technology, Wentworth Institute of Technology, Hampton University, and many others. Students from Nigeria and other African countries have found it very entertaining and inspiring. According to Rahman Ladigbolu, a Nigerian film maker based in Boston, United States: "In America: The Story of the Soul Sisters needs to be seen by our youths at home in Nigeria. The lure of life abroad has been confusing to many of us, and, for many who are able to travel out, they painfully learn that life abroad does not always justify its promise." Ladigbolu, the maker of the film lamented "in the past they were forcing us into slavery, but today we're voluntarily selling ourselves into it'? 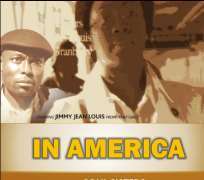 In America also starring Jimmy Jean-Louis, famous for 'Phat Girlz' and 'Heroes', tells the story of Sade through her struggles for love and green card, her inspiring friendship with African-American Sonya Muhammad, her marriage to African-American Curtis Anderson, and the relationship with her old neighborhood uncle Tai Ojo. Sade, a Nigerian medical student seeking better professional opportunity in the United States finds herself caught up in the American immigration war. With the political heat mounting on illegal immigrants, she faces a dilemma: she either continues to live on the fringes of the American society, where there's no hope for her career goal, or give up all hope on the 'American dream'. Tai Ojo, her so-called 'uncle' who has been struggling in America for more than 15 years, thinks this may be an opportunity for him to do something good for someone in his life, but the demons in his own life are up against him, and they would test his will as he shares a roof with the new immigrant Sade. In the on-going evolution of global economy and culture, people ofAfrican descents have a lot to prove and contribute, and Rahman insists that 'we're not letting others do it for us.' With IN AMERICA, he intends to be a voice that tells the African immigrant story, and of reconciliation in the complex relationship between African immigrants and African-Americans. In a planned screening tour, Rahman plans to bring the rich and educational movie to the viewing pleasure of Nigerians, students and traders, youths and parents, and everyone across the country. Given a limited release in Lagos, the movie was officially screened at the Cannes Pan African Film Festival, France, and had featured also at many festivals across the United States, Canada, Europe and Africa, and it has won accolades and awards, among which is 'Best Emerging Filmmaker' at the Roxbury International Film Festival. On the much-coveted AMAA award, Rahman confesses that it feels great to win the award, but he sees it more as a challenge to do better in the future.